This dates from the 2nd cent. BC and occupies most of the block. The entrance is followed by a closed environment decorated in ‘first style’ (the painted imitation gate, in ‘second style’, hides the point where a previous doorway was closed). The servants' quarters include the kitchen and painted lararium, to worship the Lares (domestic divinities): these are depicted at the top, with the snake agathodemone (protector of the hearth) and the Genius, protector of the head of the household. 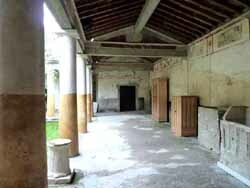 The peristyle contains plaster casts of wooden wardrobes and doors of the house. We can admire paintings attributed to the late ‘third style’, on a white background. In the triclinium is the famous painting of a mythological subject, illustrating the torments inflicted on Dirce by Amphion and Zetus: the former was guilty of mistreating their mother, and was therefore tied to a raging bull for punishment. In this room, excavators found a pile (perhaps due to the construction under way in the house) of valuable tableware, and a bronze statue of Apollo, holding what may be a tray in his arms.